Do the French love desserts? Undoubtedly. But what they call dessert is not necessarily what we're thinking of in the US. Fresh fruit? Plain yogurt? Yum! What's shocking (and gratifying) is that after several years in France, we all have converted to this definition of daily dessert, more or less, and this is especially true for the children, thanks to their experience with school lunches. Pippa's four-course lunches served to her at the table always include a dessert, but quite often that dessert is fruit, yogurt, or Fromage Blanc. The yogurt and Fromage Blanc are served lightly sugared, plain with sugar optional, or with some fruit coulis. But it's not just at school: At nearly every casual restaurant and bakery counter in France, you'll see an option of Fromage Blanc or yogurt as a dessert option. So while crazy rich crème brulées and pastries are available in France, perhaps one of the reasons that people aren't so large here is that they're not eating them regularly. There are desserts and then there are DESSERTS, if you know what I mean, and they each have their place on the table. Pippa's school serves her a real sugar treat after lunch no more than once or twice per week. Below is a much more normal, daily dessert for the French. Frankly, most Americans would call it "breakfast". After years here, I now see it as dessert. And breakfast. Twice a day is just fine with me. Yes, sharp-eyed viewers will recognized the photo from the posting on the difference between all these creamy, cultured (or not) dairy dollops. This is a recent breakfast of nectarines and Fromage Blanc. It looks remarkably like every breakfast I've eaten for about 10 years, but also remarkably like every dessert that Gigi has eaten for all of middle school so far. She can choose her own dessert, cafeteria-style, and her favorite is either plain yogurt or Fromage Blanc with a sprinkle of sugar. 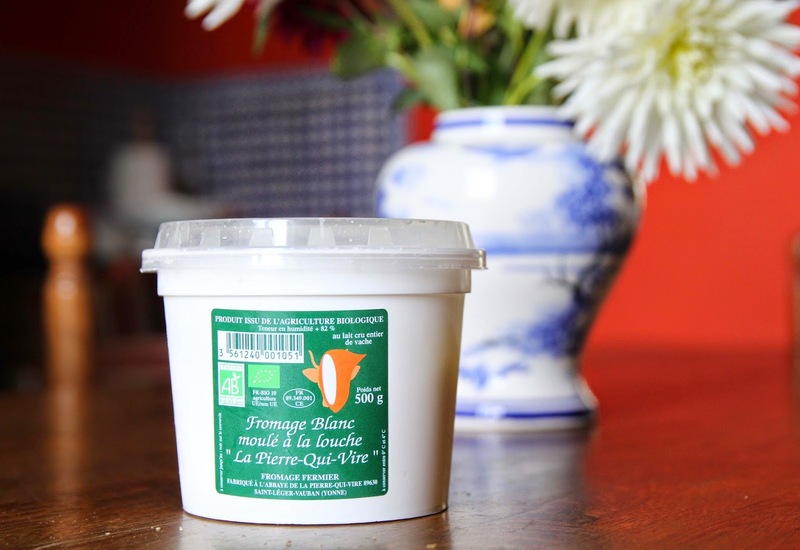 Though Fromange Blanc looks, tastes, and feels like yogurt, it is indeed a cheese, made through the same process as many cheeses. The name even means "White Cheese". Cows' milk, raw or pasteurized, is put under pressure ("Quick! Turn into something delicious!") to thicken it, then cooled back down, beaten, and strained. Fromage Blanc is a great source of calcium and protein, and works well in recipes or straight in a bowl, both for salty and sweet dishes. It tastes less tangy than a yogurt -- like all of the good, sweet creaminess with none of the sour effect. Fromage Blanc is sometimes eaten nature (plain), sometimes with salty herbs in it, but more commonly for dessert either with sugar, fruit, or fruit sauce. Depending on the manufacturer, it can be a small farmhouse cheese, or a huge industrial one. The texture can also range from unctuous and creamy to almost custardy, as in the photo above from the organic, farmhouse sample. Fromage Blanc, the cheese that's a breakfast for me, a dessert for the French, and doesn't actually taste like a fromage at all.